HABIT: Foliage like large leafed grass. Many colors, shapes of blooms and height of plants available. Blooms from late May until September. Each bloom lasts only one day but others follow. Blooms range in size from 2”-8” across. CULTURE: Easy, any well prepared and drained soil. Average water and heavy fertilizer needs. Divide in October or November every few years. Plant from containers year round. Summer flowers, background or accent plant, cut flowers. USES: Summer flowers, background or accent plant, cut flowers. Delicious edible flowers. PROBLEMS: Few serious other than aphids in the spring. Ladybugs usually take care of them. NOTES: Called Poor Man’s Orchid. Plant divisions in the fall. Container plants can actually be planted any time of the year. Native to Europe. China and Japan. 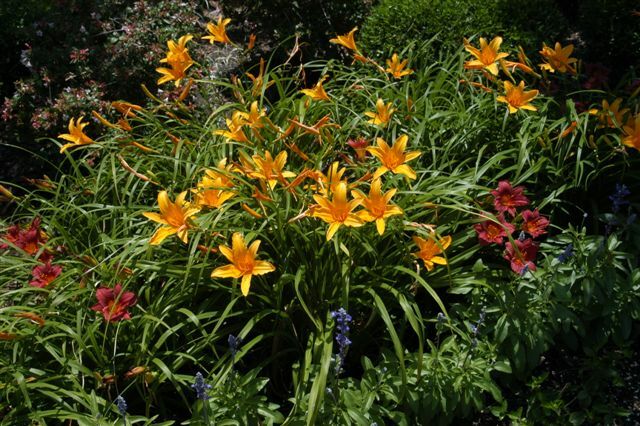 Daylilies are a gourmet vegetable.